One of NASA's last remaining structures unique to supporting the space shuttle is no more. 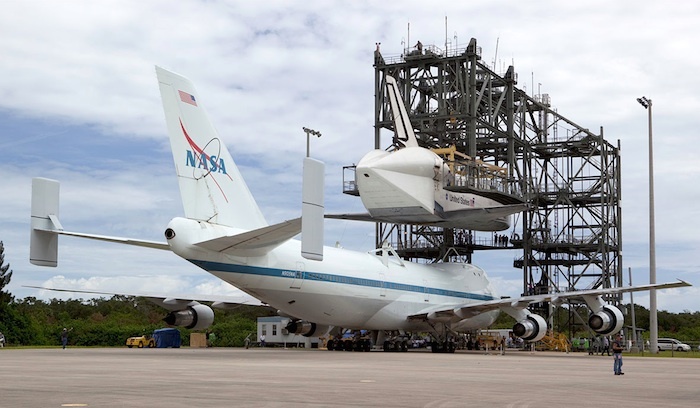 The Mate-Demate Device, which for 35 years was used at NASA's Kennedy Space Center to mount and remove the space shuttles from the back of their transport jumbo jets, has been demolished. 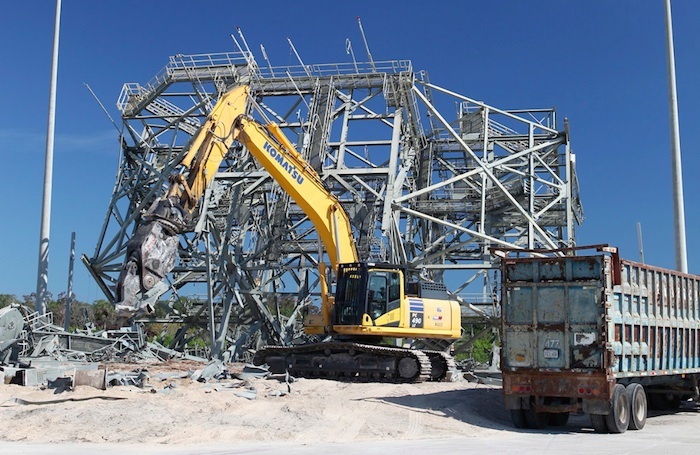 The towering gantry was toppled to make way for the Florida space center's current and future needs, NASA reported on its website on Wednesday (Feb. 4). "The MDD was a solid, well-built structure," Ismael Otero, the project manager for NASA's Construction of Facilities Division in Center Operations, said in the NASA interview. "We started the demolition project in October, and it was completed on Nov. 26, ." When the space shuttles returned from orbit to anywhere other than Kennedy, they were ferried back to the Florida spaceport riding atop one of NASA's two modified Boeing 747 jetliners, referred to as Shuttle Carrier Aircraft (SCA). After arriving at Kennedy's Shuttle Landing Facility (SLF), the orbiter-topped jets were positioned under the 105-foot-high (32-meter) MDD to hoist the shuttle off of the aircraft. The Mate-Demate Device, which stood at the northeast corner of the ramp to the runway, was also used when the shuttles needed to be flown away from Florida, either for maintenance in California while the fleet was still flying or to their museum homes at the completion of their 30 years of service in 2011. The gantry's last use at Kennedy was to mate the shuttle Endeavour to an SCA on Sept. 14, 2012. Five days later, the shuttle-jet combination took off for Los Angeles where Endeavour was delivered to the California Science Center for public display. The device's demolition got underway just over two years later with its electrical systems being disconnected and its movable access platforms being dismantled. The massive cranes that lifted the space shuttles were also removed. "Welders [then] used cutting torches to begin the process of weakening the primary load-bearing steel beams of the structure, creating wedge-shaped sections," Otero stated. "A Komatsu hydraulic excavator later pulled the sections from a safe distance." The excavator uses a cutting tool on the end of its arm to slice the steel beams, NASA's release explained. "Material handlers simply pulled on the weakened support beams. The first one broke quickly — but as more weight was placed on the others, the process slowed. The fourth and final one took three hours of pulling before giving way as planned," Otero said. The tower then toppled forward, starting the breakup of the facility. Workers spent most of November 2014 cutting the structure apart into sections that could be recycled. "Altogether we recycled about 844,700 pounds of steel, tin and aluminum from the MDD," Otero said. The Mate-Demate Device could lift up to 230,000 pounds (104,000 kilograms). A large lift beam mounted at the 80-foot (24 m) level attached to the orbiters by a sling to raise and lower them as needed. A similar device was erected at NASA's Armstrong (then Dryden) Flight Research Center in southern California. Put into service in 1977, the west coast MDD was last used to lift the shuttle Discovery following the STS-128 mission in 2009. The MDD at Armstrong was demolished between August and October 2014.